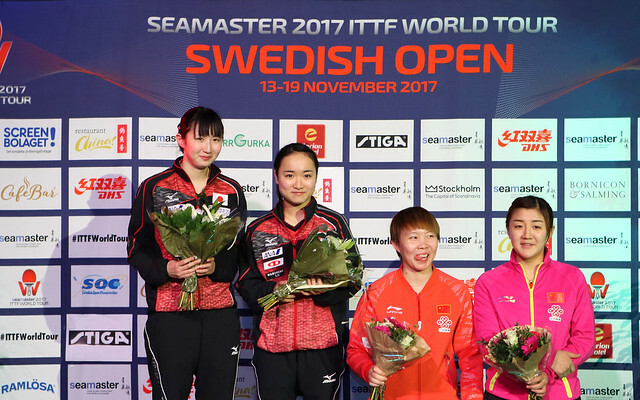 Complete success for China in the first four matches in the Women’s Singles event at the Seamaster 2017 ITTF World Tour Swedish Open in Stockholm on the morning of Thursday 16th November. Ding Ning, the top seed followed by qualifiers Chen Ke, Zhang Qiang and Sun Mingyang all emerged successful; in the next four matches; the contests which brought the top half of the draw to a conclusion, two more followed suit. Both qualifiers who caused upsets. Gu Yuting and Li Xiaodan were the names in question; a tirade of top spin attacking strokes from Gu Yuting spelt doom for the defensive skills of Japan’s Honoka Hashimoto, the no.10 seed (11-4, 13-11, 11-2, 11-4); the consistency of Li Xiaodan prevailed against the host nation’s Li Fen, the no.16 seed (14-12, 11-7, 5-11, 11-8, 12-10). More success for China against the odds but there was a result in the opposite direction. Chinese Taipei’s Cheng I-Ching, the no.7 seed recovered from a two games to nil deficit to beat Li Jiayi, a contest in which Cheng I-Ching secured the most vital of vital points. She trailed 7-8 in the seventh game before winning the next four to secure victory5-11, 5-11, 11-9, 12-14, 11-5, 11-2, 11-8). In the top half of the draw in the second round of the Women’s Singles event, the matches to be played on Friday 17th November, Ding Ning meets Chen Ke, Zhang Qiang opposes Sun Mingyang; meanwhile, Chen I-Ching confronts Gu Yuting, Li Xiaodan faces Kasumi Ishikawa.